Before the season, Clemson at Florida State was to be the first big time college football game of the season. Three games later FSU opens as a 13.5 point favorite. So what changed? It hasn’t been FSU as they’ve held up their end of the deal by outscoring their three opponents by a combined score of 176-3. It would have been 200 if the weather didn’t cause an early end to the Savannah State game. And while the strength of schedule would make the SEC proud, they at least have an ACC win over their arch-nemesis Wake Forest. If it isn’t FSU, then it must be Clemson. They’ve yet to lose, but they’ve also yet to play great. Or even up to their Top 10 ranking, especially of the defensive side of the ball. In each of their three games, the big play has hurt Clemson as they given up 4 touchdown plays of 20+ yards. The result is Clemson being a two touchdown dog, something that hasn’t happened since 2004 (a game at Miami that Clemson won, for what it’s worth). But even with the current play of the two programs, an FSU win is not automatic. And if Clemson plays to their full potential, they could not only win, but win comfortably. Recent history is on the Tigers side, with them winning 6 of the last 9, including a win in Tallahassee in 2006. Against Auburn, Clemson ran at will. Ellington had over 220 yards, including 5 runs of 10+ yards, DJ Howard had a touchdown and picked up multiple first downs. Even Boyd got into the act with 58 yards and a few key first downs. Fast forward to Ball State and Furman. 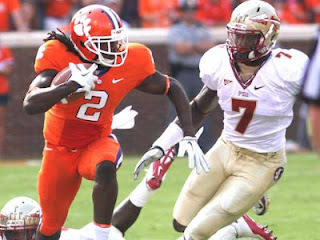 Clemson struggled to establish the run as Ellington averaged just 3.5 yards per carry. You would expect your offensive line and all conference back to have their way with the likes of Ball State and Furman, but they didn’t. Let’s hope the offense was at half speed as Boyd stayed in the pocket and didn’t take many chances. But the Tigers will need to kick the offense in a higher gear as this offense works best when the running game is rolling. It keeps the linebackers and DBs honest and forces them to think. And when they think, they get burned. And when they get burned, Clemson lights up the scoreboard. And Clemson may need to light up the scoreboard as FSU will certainly score their fair share of points. Clemson has been okay on first down, terrible on second, and excellent on third. Auburn’s lone touchdown came on second down. As did Ball State’s first. Furman’s? First down as part of a 3-play drive. Conversely, Clemson has held opponents to 9-41 on third downs. If Clemson can keep FSU from hitting the big plays, they can force them to drive the ball. And by forcing FSU to run 8-10 plays to score, they keep the ball in front of them. And hopefully the defense can make a play to keep the ball out of the endzone. Or possibly force a turnover or two. Additionally, if Clemson can keep FSU from hitting the big play, it will keep the crowd quiet. Under Chad Morris, Clemson has been exceptional on 3rd down. But against FSU’s talented D, Clemson can’t rely on converting many third and longs. Plus, Clemson needs to keep its full playbook available, and that only happens when the defense is on its heels. And for the defense to stay on its heels, it needs to be worried about more than just the pass. It needs to worry about Ellington and Boyd on the read-option and Watkins on the sweep. It needs to worry about the tight end in the zone, Hopkins on the sideline, and Watkins deep. If Clemson gets behind the chains, then the defense knows the pass is coming. This allows their talented D-line to get after Boyd and the defense to disguise its coverages. These situations are tough to overcome, can cause turnovers, and keeps the crowd lively. Clemson needs to stay ahead of the chains, keep the ball moving, their defense off the field, and the crowd on their bums. Through three games, Clemson has only started four possessions in opponents’ territory. And they all resulted in touchdowns. And three of those four possessions were the result of turnovers. Manual has shown he is prone to a mistake or two. Clemson needs to take advantage of those opportunities and put their offense in position to put points on the board. Clemson won’t find it as easy to drive the length of the field as they have against Ball State and Furman, so shortening the field will be a key to getting points. Also, it will be important that Clemson not give up any big returns, which FSU has already proven they are capable of doing. Nothing is more heartbreaking than scoring points, only to have the opposing team answer with special teams. FSU is priding itself on only giving up three points over their first three games. Clemson needs to equal or eclipse that on their first drive. If Clemson can jump on the board early, it will set the tone for the game and send a message to the vaunted FSU defense. If Clemson can score multiple times, doubt will begin to creep into the defense’s mind and it begins affecting the play-calling for the offense. And if you can alter FSU’s game plan just a little, then the first round will go the Tigers. Clemson doesn’t need to have all five keys go their way to win. But they do need a few. And if Clemson gets a few, we will have a great game on our hands. But if they get none, watch out because FSU could go all 1990’s on us. But if Clemson gets all five to fall their way? Make it 7 for their last 10 versus FSU, clear a spot for a new tombstone, and book tickets to Charlotte and Miami. The only question remaining is what date their BCS game in Miami would be. Check back later as The TigerSwag takes a look at three things FSU needs to do to win plus they make their formal prediction.